See a video about Laurier Startup Fund. Being an angel investor normally requires deep pockets. 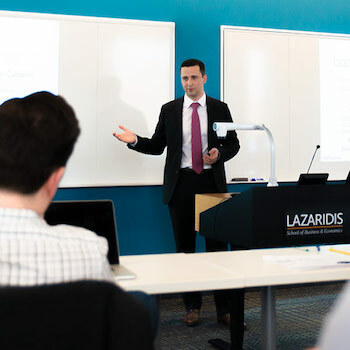 At Wilfrid Laurier University’s Lazaridis School of Business and Economics, however, students have the chance to invest real money in real early-stage companies – and thus get a crash course in the world of investing and entrepreneurship. The Laurier Startup Fund practicum is a highly unusual course, one of the first of its kind in Canada. Most of the formal lectures and readings are over within the first few weeks. Instead, the Master of Business Administration (MBA) and senior Bachelor of Business Administration (BBA) students who take the course spend most of their time doing intensive research to determine whether to invest in a company seeking funding. The innovative course and the associated fund of the same name were started in 2014, after entrepreneur and angel investor Mike Stork (BBA ’77) and his wife Hennie Stork (BA '77) donated $1 million to launch the fund. Soon after, the Marsland Family of Waterloo Region contributed $500,000 to the fund. If the decision is made to invest in a company, Startup Fund puts between $25,000 and $100,000 into it in one round. In the last four years, it has invested in 18 businesses. One of those companies went bankrupt and the fund decided to disinvest in another, getting its money back. The others, however, have done well. “Several companies in the portfolio have gone on to raise funds at much higher valuations. Based on these valuations, the fund’s aggregate value has grown by 45 per cent,” says BMO Professor of Entrepreneurial Finance Brian Smith, who runs the course and leads the oversight of the fund. As a relatively small investor, Laurier Startup Fund co-invests with others, including a lead investor from the Golden Triangle Angel Network (GTAN), a community group of accredited, high-net-worth individual and institutional investors. GTAN is a key partner in both the fund and the course. Its executive committee screens companies and identifies those with a reasonable prospect of securing funding. Every month, the larger group, including Laurier Startup Fund students and advisors, meets and listens to pitches from three selected companies. Laurier students may select some of these companies for further research. Companies may also be brought to Laurier’s attention through the MaRS Investment Accelerator Fund (IAF), an Ontario government-backed investment fund. The Waterloo Region associate director of IAF is Aaron Bast (BBA '06), a member of the Laurier Startup Fund Investment Committee, an all-alumni team of seasoned investors who help advise the students. A good pitch, however, isn’t enough. Companies need to be thoroughly researched in a process called due diligence. That’s where the Laurier students come in. If students, who work in pairs, select a company to research further, the company gives a more detailed presentation to the students and provides confidential information about its business and finances. The students study the material and formulate follow-up questions to ask managers. After the students finish their research, they prepare a report to recommend whether Startup Fund should invest in the company. They then present their recommendation to the fund’s investment committee, which ultimately decides whether to invest. Students don’t make financial profits from Laurier Startup Fund’s investments. But they still say the returns from the course are huge. Typically, students who take the course are either interested in working in the world of finance and investment or in becoming entrepreneurs themselves, says Smith. Marcus Manocha is one of the latter group. With a PhD in molecular medicine, he worked as a research scientist at a biotech startup before deciding to do an MBA at Laurier. He has started a company himself, called Beekur Consulting, which is aimed at helping academics move research from the lab to the market. One of the areas Manocha aims to help fledgling companies with is understanding the due diligence process and how to attract investors – for instance, the difference between making an academic presentation and pitching a company. The Startup Fund course, along with other courses he took for his MBA, helped Manocha consolidate his knowledge so he will be better able to help others. Sally Kim, a fourth-year BBA student, is one of those who aspires to a Bay Street finance career. She took the Startup Fund course as a follow-up to the Entrepreneurial Finance course she took previously and appreciates the practical insights she has gained into the process of raising capital. Current Laurier students interested in taking the Laurier Startup Fund course must apply online. The course will next be offered in fall 2018.